We see a lot of movies, so it’s not surprising that we would eventually see the latest in the Twilight Saga – Eclipse. Having been disappointed by the wildly anticipated Twilight, we didn’t expect too much from this 3rd installment, keeping in mind that nothing a director can put out will ever beat our own imagined perceptions of these now iconic characters. We’re far from your cookie cutter girls and are hard to please. Overall, the story from novel to screen has gotten better. But the glittering vampire bit has gotten old, and fast. The acting in these ‘films’ are wholly wooden and uninspired. With maybe the exception of Taylor Lautner and a handful of the others. The leads are just awful. The one redeeming thing about this film was the inclusion of the background stories for the other and decidedly more interesting vamps. Jackson Rathbone’s acting chops got a real workout in this one – he had actual lines rather than just tortured looks of immense constipation. Any girl who willingly goes to see this is well versed in not only the dialogue but the story itself. Having read all the books more than once, we weren’t expecting anything new or Oscar worthy. Eclipse continues with the Bella-Edward-Jacob love triangle. Jacob can’t accept the fact that Bella has chosen Edward over him. Bella is certain, that is – as certain as a teenage girl can be, that Edward is the one, meanwhile harbouring feelings for Jacob that she can’t explain. 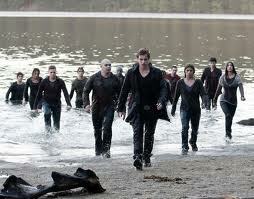 revenge over the Cullens. This of course catches the attention of the Volturi who are keen to see how it’ll play out without intervening on the Cullens behalf. We were expecting a much more satisfying fight when the Cullens and the Wolves of the Quileute tribe band together to save the sleepy town of Forks, Washington from the hungry new born vamps. This was nothing more than a ploy for Victoria to get at Bella. As this infectious vampire phenomenon continues, it doesn’t look like we will be escaping this twitwat franchise anytime soon. And while we hate to admit it, when Breaking Dawn hits theatres, we will be there, heads held high. Unlike some, which never fails; those very unwilling boyfriends who some stupid girl has dragged into the theatre with them. Now, we’re not prudes or above torturing our lesser halves, but we draw the line at this. Never would we ruin a very girly movie by dragging the balls with us. The girl next to us did just that and throughout the entire movie he did nothing but groan and complain. Very loudly. Not saying that we didn’t do the same, but we didn’t disturb other movie goers who were perhaps more into it. Maybe next time she will realize her boy aint no Edward Cullen.